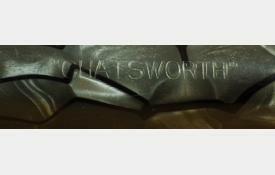 This Boots Chatsworth is based on the Burnham pen and is pretty well identical to it except for the clip and barrel inscriptions. 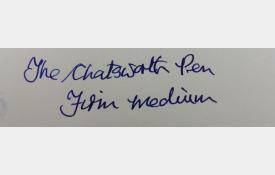 The pen measures 12.8cm capped. 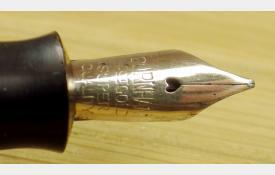 There are no cracks, scratches or bite-marks but there is an indentation in the cap lip (see photograph). The barrel inscription is clear and legible. The gold plating is good throughout. 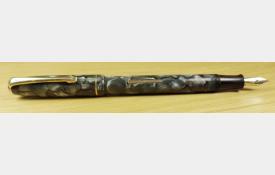 The grey with dark lines marbled pattern is unusual and very eye-catching. 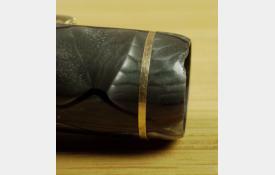 The Burnham-made 14ct gold nib is firm and medium. 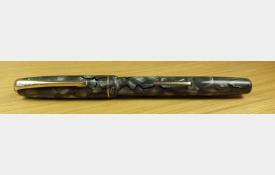 A new sac has been fitted and the pen fill and writes well (see writing sample). 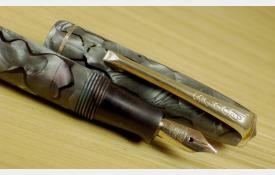 A most attractive proprietary pen, and an excellent writer.